Sugar or fat — these are the two substances your body can choose from to use for its energy, but it can't do both. People who prefer a ketogenic diet train their bodies to burn fat — both body fat and dietary fat — for a constant source of energy. You see, the liver converts the fat to ketones that fuel your body consistently. This prevents blood sugar crashes and helps rectify insulin resistance, making it a popular choice for people with blood sugar issues as well as for athletes. Foods do not contain ketones. Choosing keto diet foods that help your body produce ketones is crucial to reaping the health benefits of the ketogenic diet. The ketogenic diet isn't something to be done "halfway." The goal of the diet is to reach ketosis, the state where your body is fueling itself from ketones produced by the liver. Depending on your body chemistry, it might take a week or more for your body to do this. As your body can't fuel itself from both sugar and fats, having "cheat days" before you are well established in the diet can be dangerous to your health, because consistent high fat plus high carbs, which convert to sugar, is a recipe for disaster in the form of cardiac or other diseases. Although the medical community has touted low-fat lifestyles for decades, the keto diet plan is actually high in fat. However, when your body is burning fat and doesn't have to deal with simple carbs and sugars, it's not as dangerous as it might initially sound. A 2016 systematic review of more than 62,000 study participants published in Open Heart BMJ Journals revealed that a high-fat diet is unrelated to the development of coronary heart disease (CHD). A further study that same year published in PLOS One even let saturated fats like butter off the hook, concluding that there is no relationship between the fats and CHD. Fat: About 75 percent of your diet should be built around natural fats and oils. Protein: Roughly 15 to 25 percent of your diet should be protein from sources like unprocessed meat, eggs and seafood. Too much protein in the system converts to carbohydrates and can sabotage your diet. Carbohydrates: Only a small percentage of your diet should be carbs sourced from vegetables that grow above ground. Aim for just 20 to 50 grams of carbohydrates per day. Forget everything you previously knew about dieting. Forget about eating low-fat/low-calorie and filling up on whole grains. Once you get the hang of what your ideal amount of carbohydrates and proteins look like for the day, you won't have to measure or weigh your food either. You get to eat as much as you want whenever you're hungry. forget about meal times as much as possible and fuel your body with keto-friendly meals or snacks whenever it asks for fuel. Your body will draw on ketones manufactured from fat by your liver for energy, so you won't feel hungry as often as you do on a high-carb diet. So go ahead and skip a meal or two if you're not hungry. Don't sit down and watch TV with salty snacks such as nuts or cheese curds. The salt will make you feel hungrier, according to a 2017 study published in the Journal of Clinical Investigation, and you'll end up eating more than you planned. Don't depend on prepackaged keto food. Deceptive labeling can have you taking in more carbs than planned, meaning you'll have a harder time getting into and maintaining fat-burning ketosis. Make whole, unprocessed foods the staples of your diet, and check labels carefully for carbohydrates even if the package says "low carb" or "ketogenic." Just because two-thirds of your diet will come from fat, it doesn't mean that you can eat any fat you want. Good fats you'll want to stock in your pantry include butter, coconut oil and olive oil. Other simple oils that are made by simple pressing, churning, low heat separation or grinding are fine as well. Think of ancient oil and fat sources such as avocado oil, peanut oil, sesame oil, almond oil, ghee and fish oil. More recently invented seed and industrial vegetable oils such as cottonseed, sunflower, safflower, corn and soy should be avoided or consumed very conservatively. This is because the chemical and high-heat processes used to extract them damage the omega-6 oils and cause toxic reactions that promote inflammation and disrupt the structure of cell membranes. Not all fats are absorbed at the same rate. Fats are made up of triglycerides that are made up of carbon chains. The shorter the carbon chain, the faster your body can absorb it and convert it to ketones. 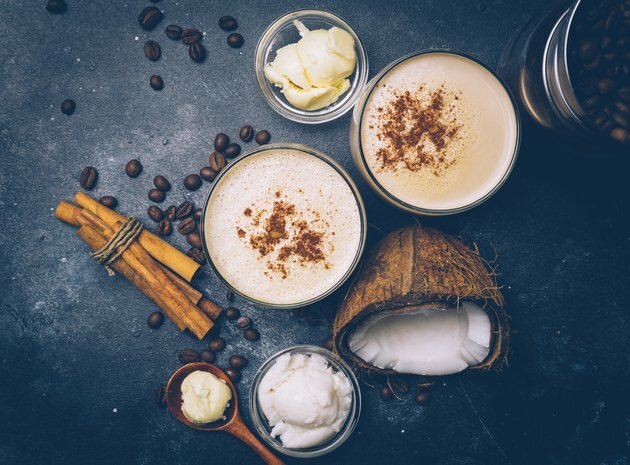 There's no need to do any scientific calculations or carbon counting, however: Coconut oil, butter and MCT (medium-chain triglycerides) are the only oils that convert quickly to ketones for a fast brain-body boost. It's important to get enough protein to keep your body from breaking down muscle for energy while it's adapting; however, eating too much protein is one of the most common beginner mistakes. You see, the body can convert an abundance of protein into glycogen — a sugar — and store the result as fat. Don't exceed the recommended daily allowance (RDA) of protein of 0.8 gram per pound of body weight unless you are in heavy athletic training in which you need more for muscle building. This means you'll probably have to cut back. According to Diet Doctor, most Americans consume far more than this amount. When you include protein in your meal, opt for any type of fresh meat, including beef, lamb, poultry and pork. Eggs, seafood and fish are other good protein sources. Avoid processed meats, such as bologna, sausage, hot dogs and ham, because filler ingredients deliver hidden carbs and sugars. You don't have to worry about trying to fill up on veggies on a ketogenic diet, but plan on getting most of your carbs from this source because you need the living enzymes the vegetables provide. Pick and choose carefully. Stick to vegetables that grow above the ground; root vegetables are high in starch and carbohydrates and often come with a high glycemic index. Lest you be turned off by the thought of all-savory flavor profiles that don't include sweets, think again. Create confections, from pancakes with berries to birthday cakes, by using keto-friendly sweeteners and baking goods. Sweeteners: Stevia and erythritol have zero grams of carbs. The two are combined in the product Truvia. Although they have zero carbs, there are not sufficient studies to know whether they affect insulin, glucose or any other part of metabolism that could derail a keto diet plan. Flours: Almond flour adds a nutty taste and has a grainier texture. You'll need a binding agent to hold it together in your confections. Coconut flour has some binding capabilities of its own and adds a somewhat sweet tropical taste. Binding agents: Eggs work well in most keto recipes, but you can also opt for psyllium husk powder if you want something with less protein. It is high in fiber, so up your water intake to avoid constipation or intestinal blockage. Flavorings: Full-fat dairy products such as butter, heavy whipping cream and cream cheese add a guilt-free richness to any dessert or confection. Dark chocolate, preferably sugar-free, and berries are the way to go; both have carbs, so they're best used as garnishes rather than the main flavor profile. Eating when hungry is a crucial aspect of the keto diet plan. However, you don't have to cook up meat or another big meal every time your stomach growls if you have keto-friendly snacks on hand. Hard-cooked eggs have less than 1 gram of carbohydrates. They're also easy to prepare ahead of time and have on hand for any snack attack. Avocado, cheese, sliced meat or filler-free cold cuts, olives and nuts are other easy options. For game day, you can create many delicious finger foods that don't divert from your diet. Put tuna, egg salad or other carb-friendly ingredients on a romaine lettuce leaf; make wraps with iceberg lettuce leaves; top sesame crackers with sliced veggies; spread or bake up some red pepper boats topped with cheese and chorizo. Nuts: It's easy to eat too many nuts, especially the salted kind that will help your body retain more water weight. Pick up a few small ramekins or salsa bowls and only put into one what you intend to eat. Close up the rest of the nuts and put them away in the cabinet. Dairy products: Cheese and other low-carb dairy products can be an ideal way to snack when you're hungry, but beware of sitting down with a bag of cheese curds or mozzarella sticks. A liberal amount of heavy cream in your coffee can also be a diet-buster. Low-carb baked goods: Using coconut flour to make low-carb bread, cakes or cookies can be an easy way to get your fix when you've "just gotta have" a sandwich, pizza or dessert. However, coconut flour has 16 grams of carbohydrates per quarter cup, although with 10 grams of fiber, it equals 6 net carbs. However, don't let the fiber fool you. Eating too much of it will constipate you. Convenience keto diet plan foods may look like a good way to grab a quick bite on the go, but let the buyer beware. Some of these foods can harbor more carbs and less nutrition than you might think. Diet Doctor: How Much Protein Can You Eat in Ketosis? Body Ecology: Are Gluten-Free Flours Easy to Digest? Healthline: How Many Calories Are in an Egg?